Twelfth Night, by Walter Howell Deverell. Lizzie Siddal was the model for the pageboy. Beatrice Meeting Dante at a Marriage Feast, Denies Him Her Salutation, by Dante Gabriel Rossetti. Lizzie Siddal was the model for Beatrice. Ophelia, by John Everett Millais. Lizzie Siddal was the model for Ophelia, and became ill after staying too long in a tub of cold water in order to create a realistic model for the painting. The Fighting Temeraire, by J.M.W. Turner (1838). Despite being a celebrated member of the Royal Academy, Turner's use of light in his paintings was unusual for his time. The Millinery Shop, by Edgar Degas. Along with his painting, the Milliners, this painting illustrates a millinery shop, this time showing a customer examining a hat. The Milliners, by Edgar Degas. Painted after Lizzie's time, this painting illustrates the milliners hard at work in a hat shop. Eve of St. Agnes, by Elizabeth Siddal. Elizabeth Siddal, by Dante Gabriel Rossetti. A Private View at the Royal Academy, by William Powell Frith. Painted after Lizzie's time, this painting illustrates a reception at the Royal Academy's Summer Exhibition. A Pet, by Walter Howell Deverell. Accompanied by a quotation: "But after all, it is very questionable kindness to make a pet of a creature so essentially volatile." Helen of Troy, by Dante Gabriel Rossetti. Annie Miller was the model for Helen. Paolo and Francesca da Rimini, by Dante Gabriel Rossetti. Lizzie Siddal is the model. Writing on the Sand, by Dante Gabriel Rossetti, depicts two lovers at the seaside. Siddal may have been the model for the woman. Lady Affixing a Penant to a Knight's Spear, by Elizabeth Siddal. Self Portrait, by Elizabeth Siddal. Bocca Baciata, by Dante Gabriel Rossetti. The model was Fanny Cornforth. Portrait of John Ruskin, by John Everett Millais. Ruskin was a patron to Lizzie Siddal. 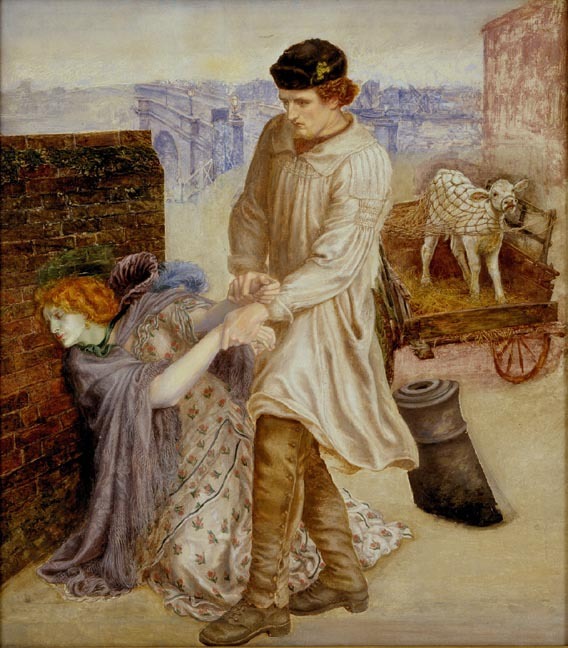 Found, by Dante Gabriel Rossetti. How They Met Themselves, by Dante Gabriel Rossetti. Hamlet and Ophelia, by Dante Gabriel Rossetti. Beata Beatrix, by Dante Gabriel Rossetti.